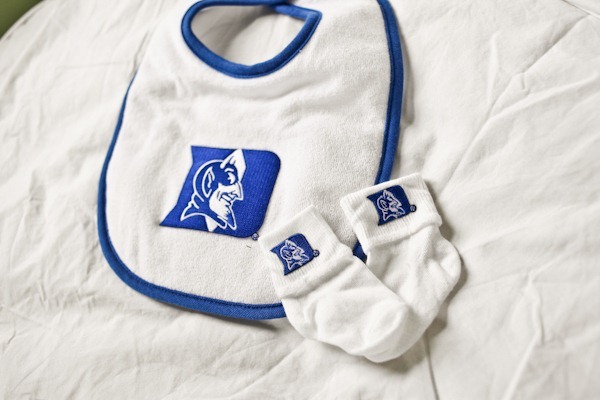 A Duke bib and socks from Matt’s grandmother Bonnie – Go Blue Devils! Board books of all kinds! A modern Boppy Cover I bought from Kidzcraftz on Etsy! A baby monitor from Kirst! Our awesome Skip Hop diaper bag from Karen! Carousel Designs changing pad (on the L.A. Baby pad that I bought), plus a funky inexpensive lamp from Target and a catch-all container Alex and Eric gave us at our Cville shower from NikJDesigns on Etsy. Can’t believe how well it matches the changing pad! 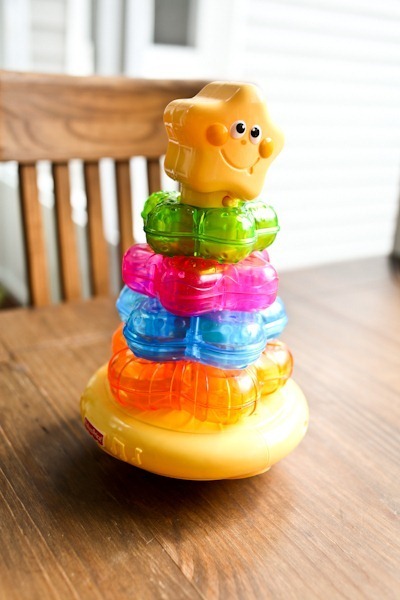 Fun toys that light up and sing! Chevron bibs and burp cloths from my sister from the Posh Pea Boutique and handmade ones by my friend Tiffany! So adorable Kath! Baby BERF is going to have a fabulous room! You will love the monitor – the pad that senses movement is so great. I was so nervous to move our guy from the bassinet to his room – all the way at the end of the hall – but this monitor made the transition much easier. He did set it off one night – he had hiccups – so his breathing was a little erratic, but I was happy that it worked! Oh my gosh-I need to get those chevron booties for my soon-to-be-here niece!! Oh Lord, that baby monitor– I hate to say this, but it became the bane of our existence. The sensor pad would have false alarms every night, which was REALLY scary– we’d go running into the nursery, terrified that she’d stopped breathing, and there she would be, just sleeping peacefully. Maybe you’ll have better luck with it. And we do like the actual monitor– we just don’t use the sensor pad anymore! I was about to post the same thing!!! We hated the Angel Care monitor for the same reason. It was nice for a couple of months until our son started moving in the crib, but then the false alarms were so annoying. We bought a Summer video monitor and loved it. One we have one with two cameras since we have two kids now and it is awesome. Wow. At first I took this as just reed the manual, not red. I was all like “meow”, but then I re-read it thought there was no way you could’ve meant it that way… Ha. Oh gosh no…. read = past tense. As in i read it last night and was wondering about false alarms too and how common they were and how sensitive the pad is! Sorry for the miscommunication! – You definitely need to put the cardboard or plank underneath and calibrate the sensitivity. – We have the two-pad unit and it took some playing around (and a few false alarms at 2am) to figure out the right placement for them relative to our son’s sleeping positions, but eventually we got them positioned so that there were no more false alarms. – The receiver and transmitter cannot be on in the same vicinity; otherwise, there’s shrill feedback (and that will wake the baby). – If you go to baby’s room in the middle of the night to nurse or cuddle him back to sleep, be sure to turn the monitor off when you pick him up! Otherwise, the alarm will go off and baby won’t be so sleepy anymore. Sure did! Still went off like crazy when he started rolling. HATED.IT. We had the exact same issues. Worked pretty well for a while (before she could roll), but once she became mobile, we had false alarms nearly every other night. We had the plywood under the sensor and everything. We just bought a Summer Infant video monitor yesterday to use instead and I’m so glad. Once they start moving around, it’s nice to see what they’re doing! Can I ask where you found your changing pad? I’m starting to look now but am not due till Nov. 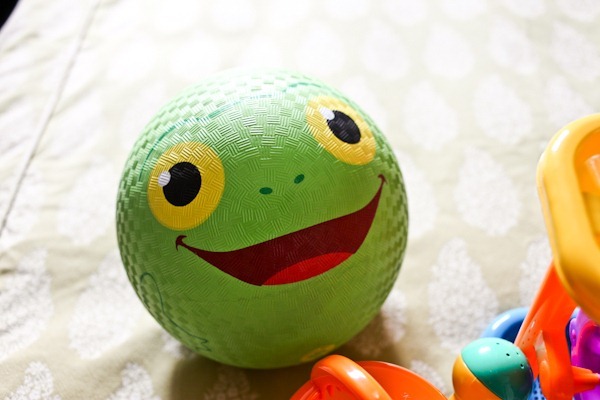 Such cute things in the baby’s room! Ah thanks – thought it was just for the cover. I’ll check it out. We have that monitor for our almost 2 year and LOVE it – the best part about it is that it only “turns on” when there is noise (ie the baby crying) so you arent listening to a sound machine over the monitor all night long. We are expecting our second child in February and will be purchasing another one for this baby. Great monitor! Oh – and we didn’t use the sensor pad … it was too sensitive. 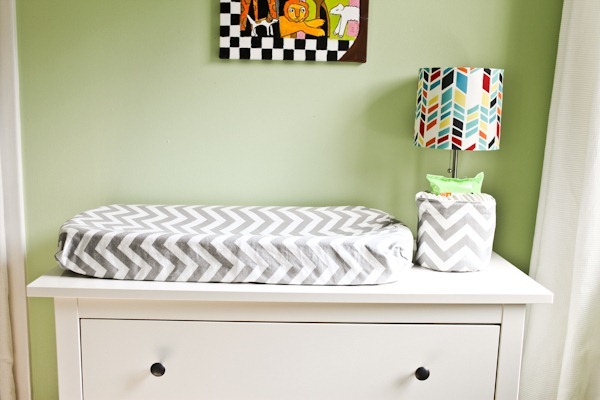 Get a multi use waterproof pad for the top of your changing pad. Then when diaper changes get a little messy you only have to change the waterproof pad and not the changing pad cover. They are super cheap and come in packs of two. We have four and that has served us nicely. 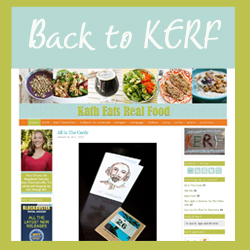 Oh goodness, you have some of the cutest gear for BabyKERF! 🙂 Awwww- it just melts my heart! 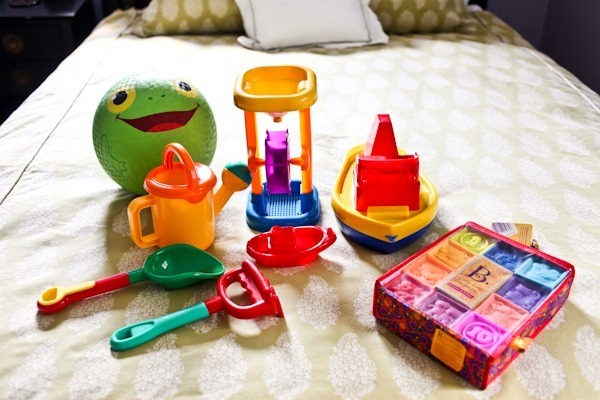 …..Each item is just adorable and I’m sure was given with so much love; which makes it that much better! I think, it would go off then, when the baby moves too much, because he/she would no longer be on the pad? I don’t know. I don’t have this monitor, or any monitor, as our nursery is 5 feet from our master. Ohhhhh I see. I wonder how absorbant it would be? I guess if baby was at one end of crib and asleep it might not pick it up if the sensor pad was in the middle? I guess we’ll have to see. In the manual they did have two pads in one picture, but I doubt we’d buy another. I also don’t know if we will use just the one, but we’ll see. Well, Anderson has been in his crib since six weeks. He pretty reliably didn’t move that much until about 12 weeks. Today he woke up rotated 45 degrees! So…the sensor is probably really useful if you are putting a tiny baby in the crib. We love our angelcare monitor. We did have our first false alarm last night, though…or rather this morning @ 5 am. Baby had woken up and moved to the edge of the crib so he was completely off the pad. If that starts happening every night we will have to retink using it, but I’m glad to know the pad is sensitive and works! The monitor shouldn’t go off if baby rolls onto his/her side. Our son rotated and wiggled a lot as he got older. Once we figured out the right placement for the sensor pads to basically “cover” the whole crib, we didn’t get false alarms. I can definitely see how people would get a lot of false alarms with one sensor pad, but with two, you shouldn’t get too many false alarms once you figure out the right position for them. Oh, one more thing – we took the movement sensor out when our son was about eight months old and have just used the sound monitor since. At that point, the risk of his grabbing the wires leading out of the sensor pads was greater than the risk of SIDS. I loved that at first too…until it started happening several times a night (and giving me a heart attack each time). I would go in and reposition my son and then he would roll back off of the sensor pad, setting the alarm off. Like other said, the monitor itself without the sensor is great but I LOVE the video monitor. So fun to see what they’re up to in there. Otherwise you have no idea (and yes, I realize that you don’t HAVE to know what your baby is doing in their crib but it is helpful to learn their sleep patterns and just plain fun). Were you able to find research on the effectiveness of the Angelcare monitor? 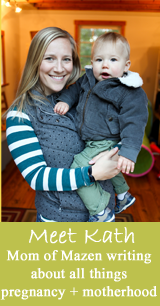 We looked at these when we had our baby but decided against one since there was no research and both the National Institutes of Health and American Academy of Pediatrics do not recommend home monitors. My research was consumer only since it’s not a health item. Love your color scheme. 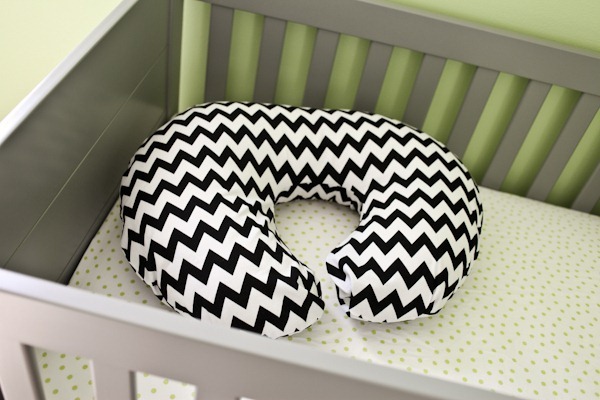 Green/yellow/gray + chevron = awesomesauce. I planned on blogging my pregnancy last year, but ended up so stinking sick I just didn’t have the energy/drive/will. I am enjoying reading your blog, because it brings back the happy anticipatory memories I had with both of my pregnancies, minus the feeling sick! I just LOVE the grey, by the way. 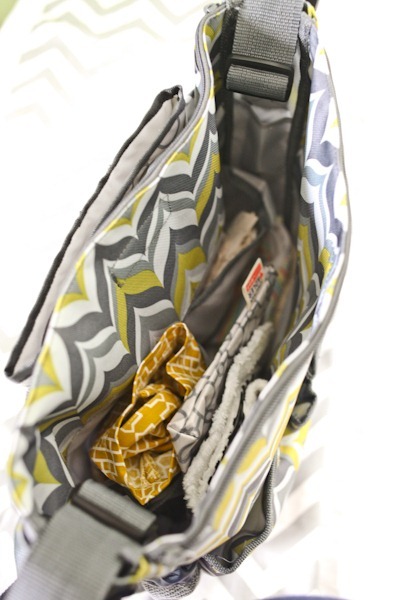 So….I would be interested to see what you think about your diaper bag, once you get it “fully loaded.” I bought a petunia pickle bottom off of craigslist, when I was 15 weeks pregnant. I love the way it looks, but don’t find it to be very big, and I don’t even take that much stuff with me yet! No bottles, no formula, no snacks. Just the basics, and I feel like it’s too small! I also cloth diaper, and have looked at this bag. Wow. That is *a lot* of chevron. I guess all the visual stimuli is good for a baby’s developing eyes! Everything is so lovely and organized. Jealous!! 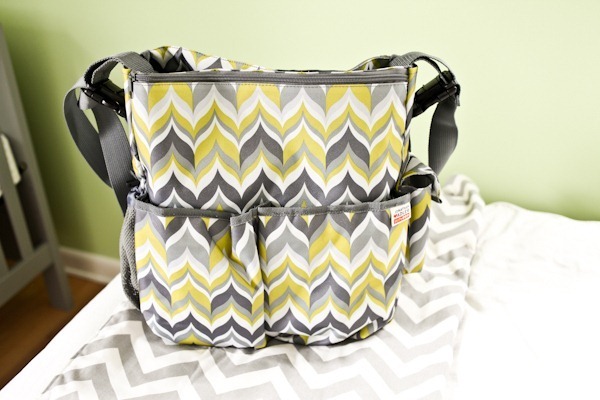 I got my husband a Skip Hop diaper bag and something fancy and stylish for myself. 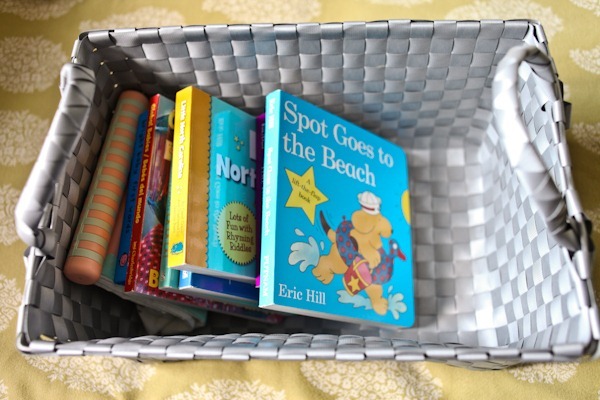 A year into our parenting endeavor, I never grab anything but the Skip Hop–it’s perfect and everything just fits really well. You’ll love using it! I love reading about your pregnancy and plans. So fun and so exciting! 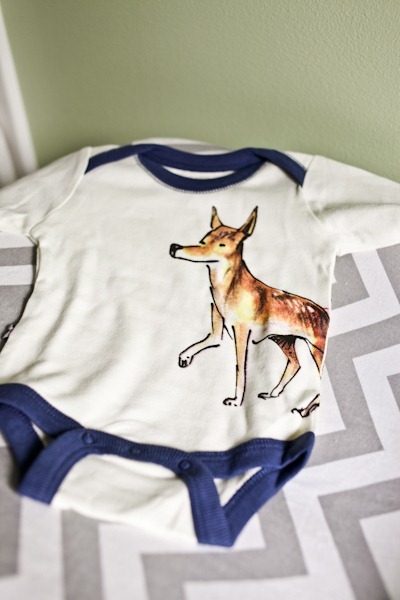 That onesie with the deer on it is TOO adorable! So many cute and useful things! I love going in the nursery now and just looking at everything since I have it all put away and organized! LOVE LOVE my angelcare monitor!! I was able to but my baby in her crib and own room at 6 weeks which led to her sleeping through the night a week later (since we werent waking each other up with every movement and whimper). I stopped using it when she became mobile because it would go off since she jams herself into the corner of her crib to sleep. But I use it still when she is sick (or after I give her a new allergenic food I turn it back on to be safe). Perfect for this super cautious mom! Some doctors consider 36 weeks full term, yay! It was one of my scariest nights when that damn monitor went off when my son was a couple of months old. It went off a couple of times after that, and even though you know it’s “most likely” false alarm, it is always scary. If I had another child, I wouldn’t be using it. A video monitor however, is AWESOME!!! Such awesome gifts!! You’re going to love the monitor..we have the same one, and we love having the motion sensor on it. It gives such a peace of mind. Your nursery is SO cute!! I love how everything matches but isn’t matchy/matchy! My baby is 6 months old and has been sleeping in her crib for the last 1.5 months. We haven’t had any problems with our Angelcare monitor. The only time it’s gone off is when I picked up the baby and started feeding her and forgot to turn off the sensor. That’s my biggest annoyance with the monitor. my son LOVES those blocks! Hey kath, i noticed you bought some nursing tanks from motherhood. i am curious how well these hold up. I am a very large chested girl and just automatically assumed they would not work for me (since normal built in bra tank dont work when i’m not pregnant). do you think they’ll work for you? Also how do you know what to pack? 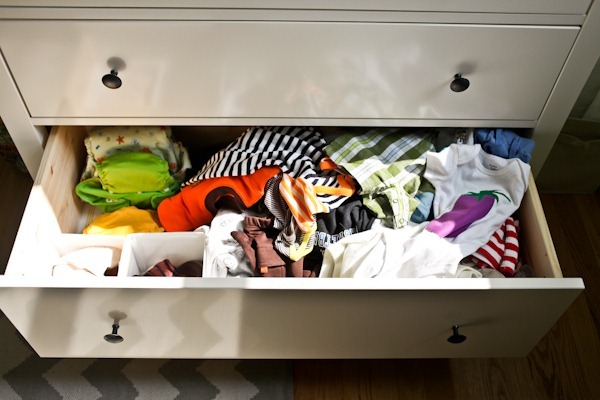 my maternity wardrobe doesnt seem big enough to pack away outfitts for a few weeks. I normally would never go braless, but I will wear these mostly at home that way. I’m sure ill wear a nursing bra too in public. 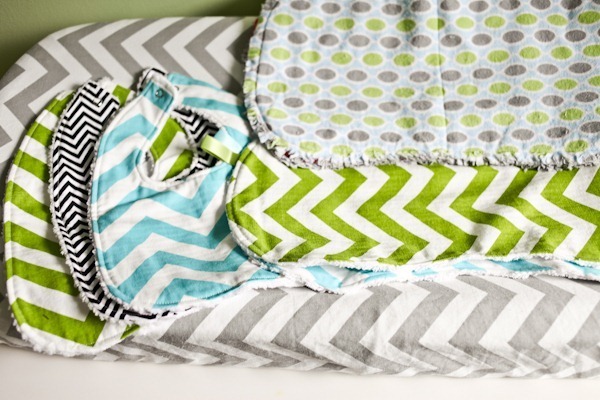 Your sister has great taste – love the bibs and burp cloths! I’m a sucker for all things chevron 😉 And I LOVE reading the comments – we registered for the same Angel Care monitor, but with the video, so now I know what to do about false sensitivity alarms. Perfect! and i love all the toys and books and fun clothes!! 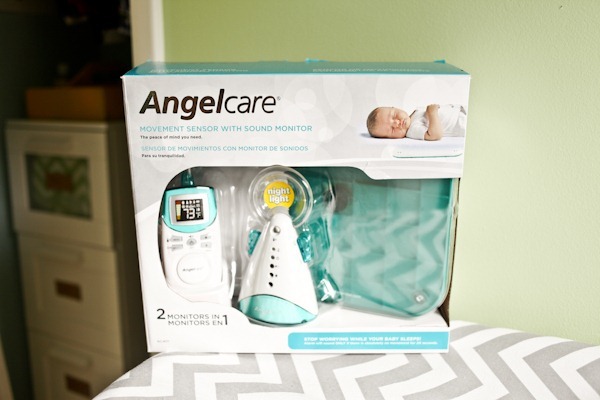 I’m chiming in to add that if there is any way you can return the angelcare monitor and get a video monitor, I would highly recommend it. I love having the video feature so we can see what is going on. We have a summer infant one and it is great.